Jake: We are hearing over and over from our family and friends that ours was the most beautiful and personal wedding ceremony they’ve ever seen. You truly “got” us, and took the time to get us, and exceeded our wildest dreams. We’ve both said the ceremony was our favourite part of our wedding, which never happens!!! Our guests felt that they were a part of the story - you nailed the community-oriented aspect. We just feel so lucky. I consider the decision by two people to unite in marriage as a sacred act. In saying that, I don’t necessarily mean it religiously. However, I don’t take marriage lightly; it’s a serious, intimate commitment between the two principals. That commitment extends to include families and community. For me ‘sacred’ signifies that a wedding stands above the day-to-day choices of life. It requires and deserves to be elevated. I’m honoured to aid in that elevation! It fascinates me to discover who people are; how they got together; what it is that attracts them to each other and what their plans are for their future together. I thrive in creating and performing a wedding celebration that reflects who the bride and groom are and what they want to include and express in that celebration. In my approach, I am disciplined and at the same time casual. I want the planning and the celebration itself to be lighthearted while acknowledging the serious nature and intentions related to the ceremony. There are only a few things that actually have to happen in a wedding ceremony for it to be legal and those things are not negotiable. The good news is that everything else is open for the choosing. Part of my role is providing you with options and much encouragement to co-create a ceremony that reflects you and what you deem important. 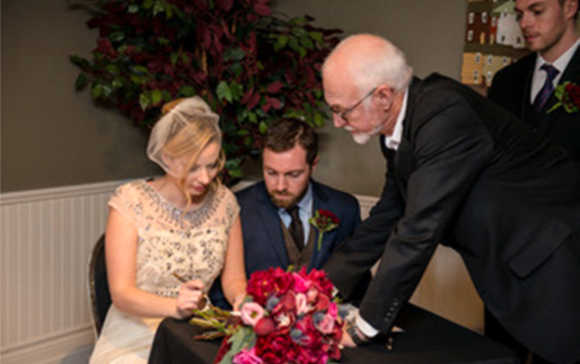 I also create and conduct ceremonies for couples wanting to recommit their vows of marriage and/or to celebrate milestone moments in their lives. One of the most delightful elements for me in co-creating a wedding celebration is having the opportunity to write a story about the couple – about how they met; what attracted them; how they became engaged and other relevant features of their relationship and experiences together. Frequently, brides and grooms and their guests claim this was one of the highlights of their ceremony. From time to time I might feature one of those stories here [only with a couple’s approval of course]. In the meantime, here’s a story of how my wife, Roz, and I were married. It’s much longer than the story I’d write for a typical wedding celebration. However, it does reflect my writing style, my interest in interesting details as appropriate and my typical balance of serious and lighthearted narrative. Just Click Below to Read!